Staphylococcus aureus is a human-host adapted, Gram-positive bacteria commonly found on the skin and in the nasal passages of people. Often considered a commensal organism, it is also an opportunistic pathogen, causing skin and invasive infections. Methicillin-resistant S. aureus (MRSA) was first reported in the early 1960s, shortly after the introduction of methicillin. In the late 1970s, MRSA infection rates increased dramatically, mainly occurring in hospitalized patients. In the 1990s, another significant change occurred when MRSA infections acquired in the community among previously healthy individuals were recognized.1 These two sources of MRSA are now referred to as HA-MRSA (health care-associated) and CA-MRSA (community-associated). In contrast, S. aureus is not host-adapted to dogs or cats. For this reason, when a pet is colonized with S. aureus, including both methicillin-resistant and methicillin-susceptible strains, the bacteria does not generally persist in the pet for more than a few weeks.2,3 The most frequent commensal Staphylococcus in dogs and cats is S. pseudintermedius, which can also be methicillin-resistant (MRSP). While S. pseudintermedius or MRSP can transiently colonize people, infections are rare.4,5 MRSA and MRSP can be thought of as mirror images, host-adapted to people or pets respectively, but with rare occurrences of colonizing or infecting the other group. Though the focus here is MRSA, infection control recommendations apply equally to minimizing transmission of MRSP within a clinic, and to staff and owners. MRSA in dogs and cats is generally acquired from people. The strains found in pets closely match those found in people in that geographic region.7 Colonization rates of MRSA in cats and dogs normally range from 0-4%; however, colonization rates in specific populations may be as high as 7-9%.1 Primary risk factors for MRSA colonization in pets are contact with an MRSA-infected person, repeated courses of antimicrobials, visiting a veterinary facility, surgery, or hospitalization for several days.7,8 Similarly, veterinary personnel have a higher risk of MRSA colonization than the general population.1,7 Current studies have shown a prevalence ranging from 4-18% in veterinary personnel compared to 1-3% in the general population,1 underscoring the importance of good hand hygiene and appropriate use of gloves in the veterinary setting. A member of a client’s household has been diagnosed with a MRSA infection. Are the household pets at risk? Yes, the pets are at risk for colonization with MRSA, but the risk is very low. The risk of infection in pets is even lower. It is recommended to limit the infected person’s contact with household pets until the person is cleared of the infection. This includes no kissing, no close cuddling, no co-sleeping, and not allowing pets to lick skin or wounds. Handwashing frequency and duration for the infected person and family members providing care should be increased, and especially performed before and after contact with the pets. 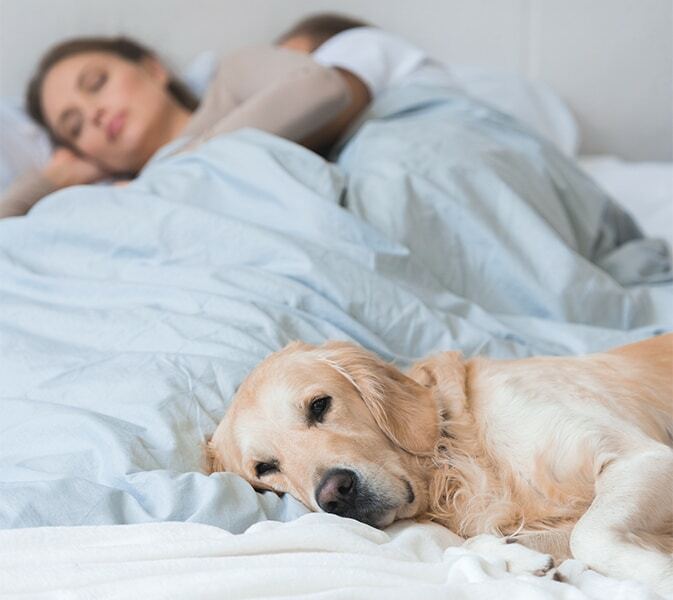 Increase routine cleaning of clothing, the environment (paying close attention to hand contact areas), and human and pet bedding during treatment. Should I test the pets if a human household member is infected with MRSA? No, in the case of a human MRSA infection, the household pets do not need to be tested. If a single test were negative, it would not rule out colonization. A pet owner who is a health care provider is colonized with MRSA. Previous decolonization attempts have failed. Should we consider the household pets as a possible source? Yes, this an appropriate situation in which to consider testing the pets. The goal in these situations is to prevent on-going MRSA transmission between humans and between human and animal household members so that colonization can be eradicated in the health care provider. Veterinarians and health care providers should coordinate concurrent testing of all human and animal household members. If animals test positive, they should be isolated or temporarily removed from the home for 3-4 weeks to eliminate ongoing exchange. Temporary caretakers should wash their hands before and after contact with the pet and avoid kissing and cuddling; however, the risk of infection is low. An animal patient had MRSA cultured from a surgical wound or deep skin infection. What precautions should the owners take? Limit contact with the pet while the pet is being treated. This means no kissing, no close cuddling, no co-sleeping, and not allowing pets to lick human skin or wounds. Increase frequency of handwashing in the house, including before and after contact with the pet, their bedding, and any item with which the pet has contact. People with skin wounds, infections, recent surgery, or who are immunocompromised should not care for the pet during this time. Wash hands and wear gloves for wound care and dispose of used bandage material immediately. Change gloves before handling clean bandage material. Thoroughly wash hands after removing gloves. Increase routine cleaning of the environment, paying close attention to hand contact areas, such as door knobs and light switches. Hand contact areas and pet water/food bowls should be cleaned at least once a day. Pet bedding should be laundered daily. Keep pets isolated to an easily cleaned area of the house. Keep pets off beds and pillows used by people and away from carpeted and upholstered surfaces. Pet owners who are also health care providers or veterinary personnel should take extra care at work to perform good hand hygiene and use gloves appropriately. Continue all precautions until the patient’s infection has healed, antibiotics have been discontinued and the patient has had two consecutive negative cultures (see screening recommendations below). A person with a MRSA infection should limit contact with their pets until the infection has cleared. This means avoiding kissing, close cuddling, co-sleeping, and allowing pets to lick skin or wounds. An animal patient had MRSA cultured from a surgical wound or deep skin infection. What precautions should my veterinary staff take? Bring patients directly into an exam room when presenting for an appointment and do not allow them to mingle with other clients and their animals. House hospitalized animals with known MRSA infections in an isolation suite or away from other patients with their own dedicated equipment and materials. All staff should wear gloves and gowns when handling and caring for the patient until the animal is cleared of MRSA infection. When performing bandage changes, keep the dirty bandage materials separate from the clean bandage materials. Gloves should be changed in between handling the dirty and clean materials. Clean and disinfect (according to disinfectant manufacturer’s instructions) the table, floor and other hand contact areas (door knobs, cabinet handles, faucet handles) in the area where any procedures are performed and/or where the patient was housed during their visit. Hands should be thoroughly washed when interaction with the patient is complete. Staff with skin wounds or who are immunocompromised should not clean patient’s wounds. All precautions (gowns, gloves, prevention of co-mingling, and isolation in hospital) should be taken until the patient’s infection has healed, antibiotics have been discontinued and the patient has had two negative consecutive cultures (see screening recommendations below). These infection control recommendations should be followed for patients with MRSP infections as well. How do I screen a patient for MRSA if needed? Use sterile cotton swabs to sample at least two areas on each patient. The pharynx, perineum and corner of the mouth are the most sensitive sites,11,12 but others have sampled just the nares and perineum. Swabs can be pooled and submitted as one sample. Order a culture and sensitivity and let the laboratory know that you are specifically screening for MRSA. Repeat, if applicable, a minimum of 7 days later. What precautions should I use for all wounds? Culture infections prior to administering antibiotics to identify resistant infections and treat them accordingly. Use standard precautions:14 proper hand hygiene, gloves, and protective outerwear (lab coat or smock). Wear gowns and use gloves when caring for seeping or infected wounds. Sterilize partial rolls of bandage material before re-using or discard them. What is the mechanism of methicillin resistance in MRSA and MRSP? Weese JS. Methicillin-Resistant Staphylococcus aureus in Animals. ILAR Journal 2010; 51(3):233-44. Loeffler A, Pfeiffer DU, Lindsay JA, Soares-Magalhaes R, Lloyd DH. Lack of transmission of methicillin-resistant Staphylococcus aureus (MRSA) between apparently healthy dogs in a rescue kennel. Vet Microbiol 2010 Feb 24;141(1-2):178-81. Morris DO, Lautenbach E, Zaoutis T, Leckerman K, Edelstein PH, Rankin SC. Potential for pet animals to harbour methicillin-resistant Staphylococcus aureus when residing with human MRSA patients. Zoonoses Public Health 2012 Jun; 59(4):286-93. Frank LA, Kania SA, Kirzeder EM, Eberlein LC, Bemis DA. Risk of colonization or gene transfer to owners of dogs with meticillin-resistant Staphylococcus pseudintermedius. Vet. Dermatol 2009; 20:496–501. Starlander G, Borjesson S Gronlund-Andersson U, et al. Cluster of Infections Caused by Methicillin-Resistant Staphylococcus pseudintermedius in Humans in a Tertiary Hospital. J Clin Micro 2014; 52(8): 3118-3120. Davis JA, Jackson CR, Fedorka-Cray PJ, Barrett JB, Brousse JH, Gustafson J, et al. Carriage of methicillin-resistant staphylococci by healthy companion animals in the US. Lett Appl Microbiol. 2014; Jul;59(1):1-8. Loeffler A, Lloyd DH. Companion animals: a resevoir for methicilin-resistant Staphylococcus aureus in the community? Epidemiol Infect 2010; 138:595-605. Loeffler A, Pfeiffer DU, Lindsay JA, Soares Magalhaes RJ, Lloyd DH. Prevalence of and risk factors for MRSA carriage in companion animals: a survey of dogs, cats and horses. Epidemiol Infect 2011 Jul; 139(7):1019-28. Lefebvre SL, Weese JS. Contamination of pet therapy dogs with MRSA and Clostridium difficile. J Hosp Infect 2009 Jul; 72(3):268-9. Iverson SA, Brazil AM, Ferguson JM, Nelson K, Lautenbach E, Rankin SC, et al. Anatomical patterns of colonization of pets with staphylococcal species in homes of people with methicillin-resistant Staphylococcus aureus (MRSA) skin or soft tissue infection (SSTI). Vet Microbiol 2015 Mar 23; 176(1-2):202-8. Windahl U, Reimegard E, Holst, BS et al. Carriage of methicillin-resistant Staphylococcus pseudintermedius in dogs-a longitudinal study. BMC Veterinary Research 2012; 8(34). Bender JB, Waters KC, Nerby J, Olsen KE, Jawahir S. Methicillin-resistant Staphylococcus aureus (MRSA) isolated from pets living in households with MRSA-infected children. Clin Infect Dis 2012; 54(3):449-50. Williams CJ, Scheftel JM, Elchos BL, Hopkins SG, Levine JF. Compendium of Veterinary Standard Precautions for Zoonotic Disease Prevention in Veterinary Personnel: National Association of State Public Health Veterinarians: Veterinary Infection Control Committee J Am Vet Med Assoc 2015 Dec 1; 247(11):1252-77. Paterson GK, Harrison EM, Holmes MA. The emergence of mecC methicillin-resistant Staphylococcus aureus. Trends in Microbiology. 2014; 22(1):42-47. Malia graduated from the University of Minnesota College of Veterinary Medicine in 2004 and practiced small animal medicine for 10 years, with an interest in preventive medicine and nutrition. She earned an MPH in Epidemiology from the University of Minnesota School of Public Health in 2016, and currently works as an epidemiologist in the Zoonotic Diseases Unit at the Minnesota Department of Health. Her disease focus is fungal infections in humans and animals. Leslie, a Certified Veterinary Technician since 2002, currently works at the Minnesota Department of Health in the Zoonotic Disease Unit. Leslie was the Infection Control and Safety Technician at the University of Minnesota Veterinary Medical Center for nearly 8 years and has experience in infection control and occupational health specific to the veterinary field. She has also been a member of Association for Professionals in Infection Control and Epidemiology (APIC) since 2008. Joni graduated from the University of Minnesota College of Veterinary Medicine in 1982 and joined a mixed animal practice in Watertown, Minnesota. In 2001, she earned an MPH in Environmental Microbiology from the University of Minnesota School of Public Health. Dr. Scheftel currently serves as State Public Health Veterinarian and supervisor of the Zoonotic Diseases Unit at the Minnesota Department of Health.